Here you'll find a medley of premades, requests, resources, and more! The site was created february 20th, 2012 by me, imp0st3r. Display our buttons/banners on your lookup, petpages, shop, etc. Is your site in need of some remodeling? Check out some of my design makeovers featured on the left. 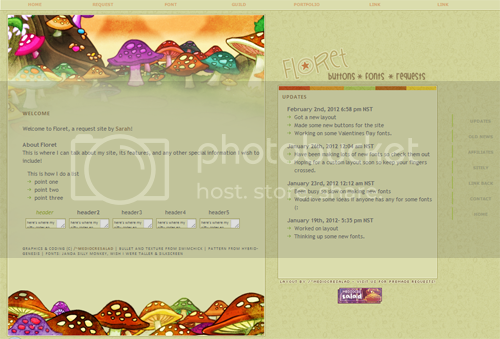 If you request a userlookup, petpage or guild layout, I will customize the text and design for the version you receive. However, I may also modify it to create a premade version for other neopians to use at a later time. The premade code will be released a month or two after your request is filled, so you get to use the original layout exclusively for a set period of time, or until it is no longer needed. Why? The reason for this is that many guilds change their layouts every month or so, many users change their userlookup designs regularly, etc., at which time my work would be discarded. I find this terribly saddening, and wish for my work to be recycled and shared by many neopians after it is no longer useful to the original person who requested it. ***Requests must be NEO-RELATED. I reserve the right to refuse a request for any reason. Your request may be accepted or declined, depending on my preferences and schedule, and completion time varies from days to weeks. Requests can be customized, HOWEVER, a premade version of your request may be made for the site, to be released at a later date. did you read my policy? Is your design... Graphic-based -or- css-based? Text: What would you like it to say? General design: Where is everything positioned? How many text areas are there? Etc. What are you using this design for? : pet application, guild function, personal use, etc. Why should I fill your request? : why is this request important? * Requests that have answered YES for this question have a higher probability of being accepted. PLEASE ALLOW ENOUGH TIME FOR ME TO FILL YOUR REQUEST--PLEASE DO NOT REQUEST ANYTHING WITH A DEADLINE OF LESS THAN 2 WEEKS, SUCH AS HOLIDAYS OR GUILD EVENTS. PLEASE ALSO LINK ME TO A FULL SIZE IMAGE--NOT A THUMBNAIL. THANK YOU. If you use graphics or coding from this page, always state where you got them, and leave a link back to /~mediocresalad. There is a ZERO TOLERANCE policy for theft from this site. If I see it, it will be reported to TNT immediately, without warning. Thank you for choosing Mediocre Salad for all your graphic and coding needs. 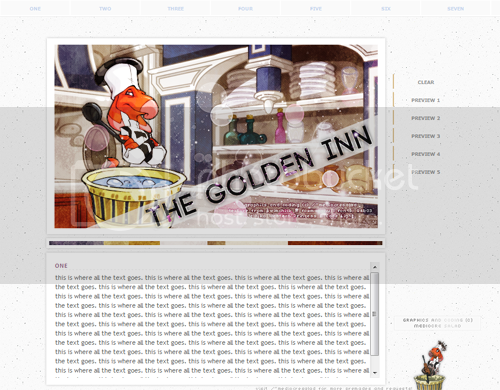 I enjoy making and creating projects for you and your site/guild, and I appreciate your support!